Have you ever visited Durres? The big city Durres at the coastline of Albania is the most important harbor city in the country. Not only from economic viewpoint but also culturally it is a capital. Cultural events and feastings take place all over the year. 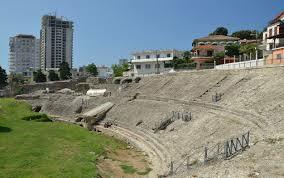 An important role in these events has the amphitheater, which is one of the most important attractions of the city. The impressive ancient building could provide place for about 20.000 people in the past and can be visited today. Durres is one of the touristic centers of the country and besides culture and history it provides beaches and holiday fun.